I’ve been reading up on the link between vision and the vestibular system. It’s been quite instructive to say the least. Of course it’s annoying not to be able to align the eyes and have double vision while reading etc… However, there’s more. It’s very interesting how compromised eye movements, in large part due to eye muscle surgery, and consequently a compromised Vestibulo-Ocular Reflex are likely to be the biggest source of disability and fatigue for me personally. When going beyond my relatively low visual endurance limit, the sensory conflict between the visual and the vestibular gets exacerbated. It sometimes feels like being drunk and can even give me something resembling to a hangover later on. Not merely alignment of the eyes but also the integration of these ocular motor skills with the vestibular system will be crucial in terms of lasting vision therapy results and daily functionality. What is the vestibular system? The term ‘vestibular’ comes from the Latin ‘vestibule’ which means room. This ‘room’ is located in the inner ear and contains a minute amount of chemical fluid. Its workings involve the detection of fluid movement by receptor hair cells in various differently oriented semicircular canals. Vestibular injury may or may not be accompanied by hearing loss. The vestibular sense is often misunderstood or overlooked. That’s because, for instance, there is no such thing as a primary vestibular cortex. Without going into detail, we can conclude this sense is for a large part located in the primitive, reptilian part of our brain which houses many basic but vital functions. In fact, this sense is so essential to our functioning and well-being, that the vestibular nerve is the first fiber tract in the brain to begin myelination during pregnancy. This process starts by the last week of the first trimester. By the end of the fifth month of pregnancy, the vestibular organ has reached full size with ongoing myelination of pathways to the eyes and the spinal cord. Whereas the anatomy and chemistry of the vestibular system itself are fascinating, its interaction with the visual system and other somato-sensory systems are even more interesting. (4) providing spatial orientation or perception of body movement. The primary role of the vestibular system is to provide the brain with information to regulate posture and to coordinate eye and head movements. Proper vestibular functioning and integration with the other senses is of major importance to good overall health, optimal functionality and vision. Even though the vestibular sense might often be overlooked by physicians, one will be made aware of its existence in case of dysfunction. Inappropriate nystagmus may also be provoked by head shaking and indicates an imbalance of dynamic vestibular function. An indicator of inappropriate nystagmus of central origin, caused by brain dysfunction rather than dysfunction of the peripheral organ, is often the inability to inhibit nystagmus with visual fixation. Feeling disoriented, especially in dark areas, or feeling spacey, floating, rocking, or lightheaded. Dizziness is not always related to vestibular dysfunction but may indicate non-vestibular causes, one of which being visual disorders. However, when dizziness is mentioned, involvement of a vestibular dysfunction must be considered. Even though dizziness and vertigo are often used interchangeably, technically there is a difference. Vertigo refers to the illusion of movement, typically rotational, when no actual movement is observed. True vertigo refers to vestibular system involvement. Of the top of my head I can think of two interesting cases I read about involving vestibular dysfunction. In the book ‘The brain that changes itself’, Norman Doidge described a woman who felt like she was perpetually falling due to vestibular injury. Her vestibular organ was damaged but her central vestibular processing capabilities were intact. We can’t even start to imagine how she felt. It completely ruined her life. Until a certain Doctor thought of the idea to supply her brain with ‘vestibular input’ in a different way. He connected an accelerometer to a tongue outlet which gave her a certain signal depending on the direction towards she was falling. Through the mechanisms of brain plasticity she learned to ignore her vestibular organ and to stabilize herself using this new input stream. Somehow over time, as her brain re-calibrated, she became less dependent on the device and needed it less and less. Another vestibular story was featured in Oliver Sacks’ ‘The man who mistook his wife for a hat’. A Parkinsonian, 93 year old, retired carpenter whose vestibular sense had become more and more unreliable started walking tilted over to one side without knowing it. His senses deceived him until he saw himself on camera. He was speechless. After this discovery he wondered whether he could apply the mechanism of a spirit level to his problem. He designed a pair of glasses including some sort of spirit level which he could then use to teach himself to walk upright again. 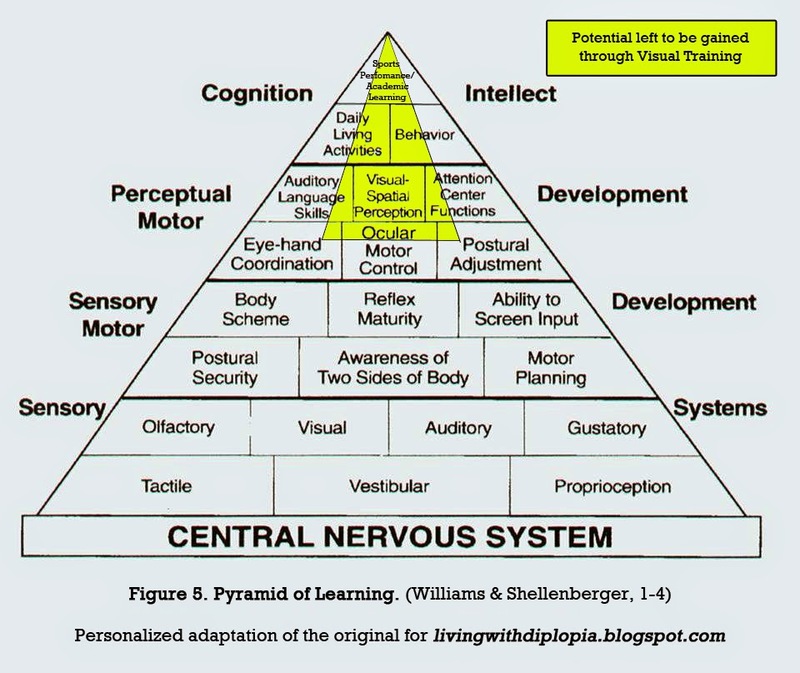 Essentially he retrained his impaired vestibular system using visual feedback. At first it took a lot of conscious effort but later on it got easier and easier. Just like learning how to drive a car. - Bithermal Caloric irrigation test (COWS): spraying water in the ear. Check it out on Youtube. It’s pretty cool. Please read Chapter 9 of ‘Vision Rehabilitation‘ for more detailed information. Vestibular injury or dysfunction can impose dramatic alterations in a patient’s once active lifestyle. There will be occasions when medication can be helpful in the short term. Surgery is the rare choice. Therapists take caution when a patient has other disabilities (brain trauma, stroke, peripheral neuropathy, spinal conditions, and/or vision disorders), which may limit choices of exercises. ‘A key factor in achieving the best outcome will be patient compliance. Education is the greatest tool used by a good therapist to engage a patient’s willing participation in what is usually a difficult treatment program. Between, both, the vestibular therapist and the psychotherapist the patient is assisted in understanding the basics of the dysfunction: Why symptoms occur; the emotional response; and how treatment should help. Initial treatment typically provokes unpleasant symptoms but feeling worse comes before feeling better. Another factor in achieving the best outcome involves adequate intensity and duration of the treatment program. Is it a vision problem or vestibular problem? It’s important to figure out whether you are suffering from a vestibular problem with a visual component or a vision problem with a vestibular component. For strabismics who identify with some of these issues, the answer is probably ‘a vision problem with a vestibular component’. When my vision tends to go blurry or double and I feel dizzy, it’s time to take a break. I flirt with my limit, take sufficient rest and remind myself that sometimes you do have to feel worse before feeling better. Improving these elementary vestibulo-ocular skills does influence and improve more sophisticated and more cognitively taxing ocular motor activities such as reading. The ground is being prepared! I have had strabismus since I was a small child. I underwent surgery when I was 12 years old, but the change was only cosmetic and I can continued to repress vision in One eye. This adaptation allowed me good academic progress through a masters degree and caused made little problems concerning balance. When my in there right ear was destroyed by an ear infection at age 65, did I find myself nearly totally disabled. So many of the therapies to correct vestibular balance problems depend on coordination of the eyes, that I was unable to benefit from them. can you hypothesize what treatment modalities might be most helpful to me now. I am a marriage and family counselor by profession.